If you want a new sound bar but the thought of coughing up some serious cash for the popular Sonos Playbar doesn’t tickle your fancy, we have some good news. There’s an even more popular sound bar on Amazon, and it’s on sale right now for one-tenth of what Sonos charges. Literally. 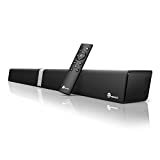 The TaoTronics 34-Inch Sound Bar is Amazon’s best-selling model, and it’s on sale today for just $71.24 after a discount and a 5% on-site coupon. At that price, you’d have to be crazy to pass this up.